What is the impact of Apex Learning Comprehensive Courses on credits earned for PBD participants? During the 2015–2016 school year, 1,465 students participating in the PBD program attempted 5,965 Apex Learning Course enrollments. Eighty-three percent (83%) of enrollments (4,937 out of 5,965) were completed by 1,292 students with a passing grade, earning a total of 2,888.5 course credits. The percent of credits earned for Courses attempted ranged from 78.9% to 86.5% by subject. 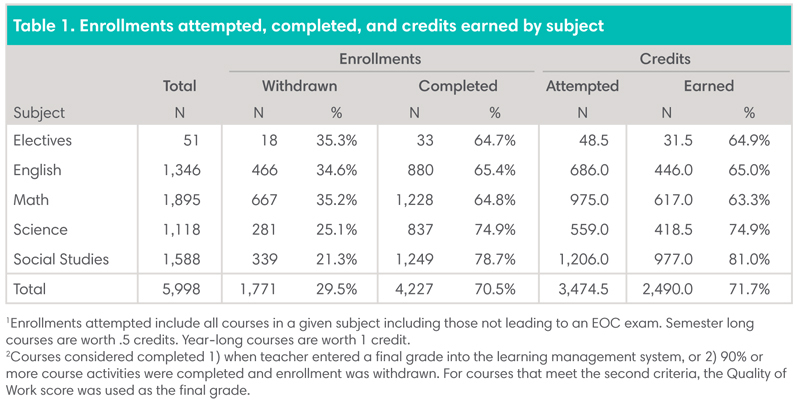 Table 1 shows the number and percent of enrollments withdrawn, completed, and passed; total credits attempted; and percent earned by subject. Table 5 in the appendix shows Apex Learning Course usage characteristics for enrollments completed by PBD participants. Do students in the PBD program completing Apex Learning Comprehensive Courses for original credit or credit recovery perform the same or better on EOCs as similar students completing courses for original credit in traditional classrooms? 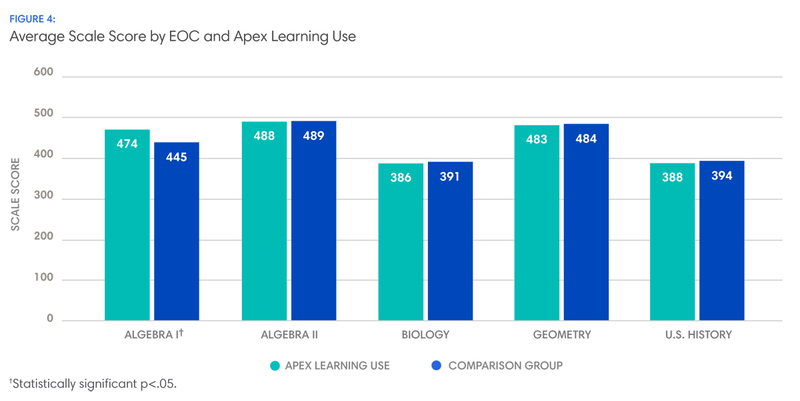 Students using Apex Learning Courses achieved greater or similar average scores on the five tested subject areas: Algebra I, Algebra II, Biology, Geometry, and U.S. History. On the Algebra I EOC, students using Apex Learning Courses gained 29 scale score points compared to similar students completing courses for initial credit in traditional classrooms (F = 10.57, p < .00, g = .64; Figure 4). The difference in Algebra I achievement between Apex Learning users and the comparison group is equivalent to a 23 percentile point gain for students using Apex Learning Courses. On the Algebra II, Biology, Geometry, and U.S. History assessments, students using Apex Learning Courses demonstrated similar average achievement as students completing courses for initial credit in traditional classrooms (p > .05). The average scale score by EOC for each group is displayed in Figure 4. Table 7, located in the appendix, shows the estimated average scale score, difference between average achievement, and effect size of the difference between groups by EOC.